Wrap anything in bacon and I’ll try it, at least once. 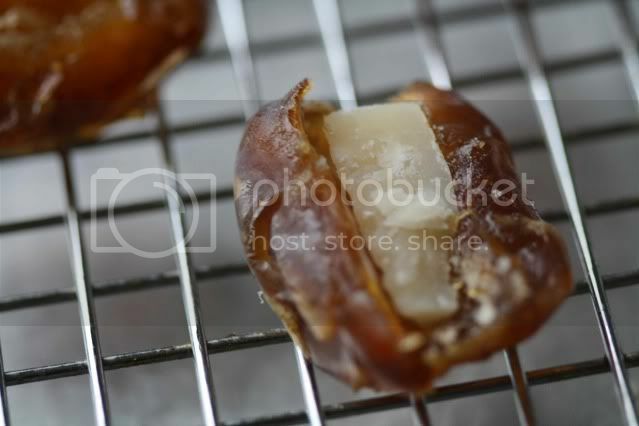 Wrap something sweet with salty bacon and stuff it with cheese and I am probably going to get addicted. If you haven’t been to AOC in Los Angeles, you should know that you can feed your addiction to the perfect combination of sweet, salty and cheesy with Suzanne Goin’s bacon-wrapped dates. The first time I had them I was hooked and have ordered them on every subsequent visit (and there have been many). It’s hard to believe that such a flavorful appetizer is made up of only three ingredients, but its simplicity makes it an easy dish to recreate at home. The first time I made these I replaced the bacon with what I saw as a more sophisticated option – prosciutto. Mistake. Serious mistake. This dish is perfect as is. Don’t mess with it. When Gourmet printed this recipe in their October 2005 issue, they allotted three dates per person. I have modestly increased that number to five per person. People will not be able to stop eating these so make sure you make plenty. If the dates are not already pitted, use a paring knife to make a small slit to remove the pit. 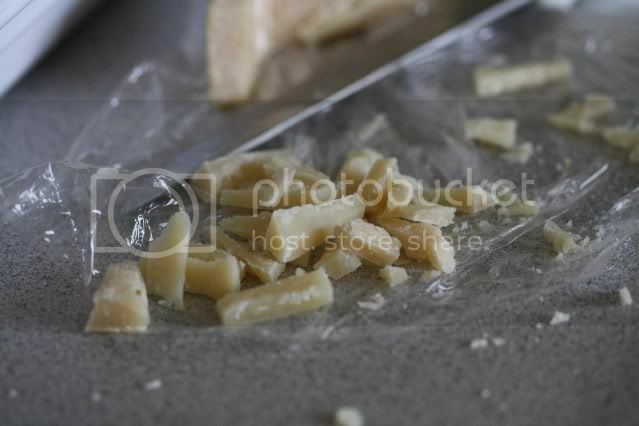 Replace the pit with a piece of parmesan and reform the date around the cheese. Wrap each date with a piece of bacon. Place on a rack set over a rimmed baking sheet. 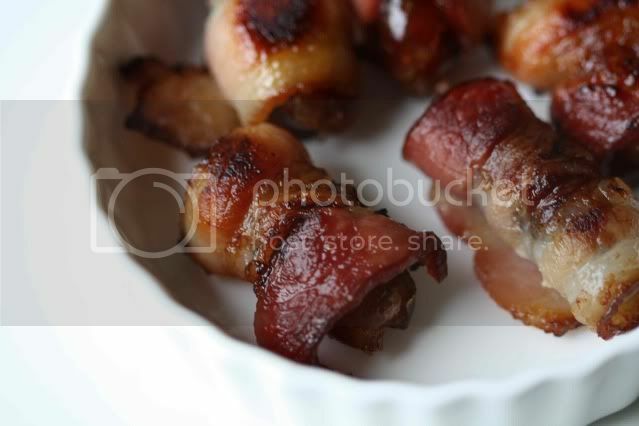 Bake for 15 – 20 minutes until the bacon is browned (cooking time will vary depending on the thickness of your bacon). Remove from the oven and serve immediately while still warm. I was going to put these on my blog also! You always beat me to it. I usually use blue cheese, but parmesan is a great idea. YUM. Just had to speak up because these are SO great with blue cheese. I'd allocate a lot more per person too. We like to call them: Devils on Horseback. Oh yeah! I love me some bacon. That looks like the perfect combo of salty and sweet...I'll have to bring that to book club next time. These look like wonderful party appetizers. Oh my. I could throw down on these. I bet I could eat more than 5...in fact I'm sure of it. Thank you for posting, I am definitely going to try these next time I have friends over for cocktails. yum! we made a version of this on NYE and it was huge hit. 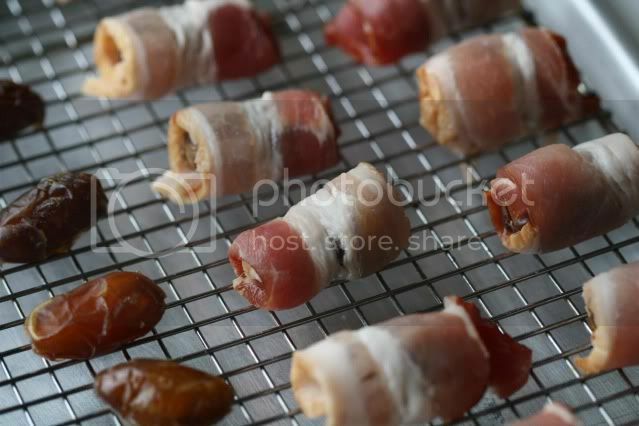 toasted almond and honey goat cheese-stuffed dates wrapped in bacon. oh. my. Oh, yeah. I remember these. They were eight different kinds of awesome. These look over-the-top delicious. I make our with blue cheese. I'll have to give your version a try. Ooh, nice, I often make this kind of thing as an appetizer (without the cheese though, I'll have to try that). Another combo that works really well is pieces of banana wrapped in bacon and cooked the same way. The crispy bacon around the almost-caramel-y banana is sooo yummy. Great idea with the cheese! Yummy! Those look amazing! Your kitchen gets incredible light. I just love all of your images. I agree -- they're so easy and delicious! Yours managed to look not-pornographic. When I photographed them for my New Year's Eve dinner, my husband looked at all the pictures and said "They look obscene." And they totally do. But what can you do?